Charles Lenox, Member of Parliament, sets sail on a clandestine mission for the government. When an officer is savagely murdered, however, Lenox is drawn toward his old profession, determined to capture another killer.1873 is a perilous time in the relationship between France and England. 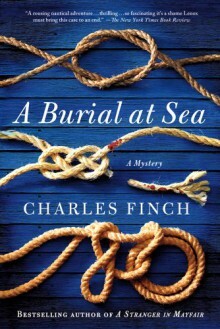 When a string of English spies is found dead on French soil, the threat of all-out war prompts government officials to ask Charles Lenox to visit the newly-dug Suez Canal on a secret mission.Once he is on board the Lucy, however, Lenox finds himself using not his new skills of diplomacy but his old ones: the ship’s second lieutenant is found dead on the voyage’s first night, his body cruelly abused. The ship’s captain begs the temporarily retired detective to join in the hunt for a criminal. Lenox finds the trail, but in the claustrophobic atmosphere on board, where nobody can come or go and everyone is a suspect, he has to race against the next crime—and also hope he won’t be the victim.At once a compulsive murder mystery, a spy story, and an intimate and joyful journey with the Victorian navy, this book shows that no matter how far Lenox strays from his old life, it will always come back to find him.